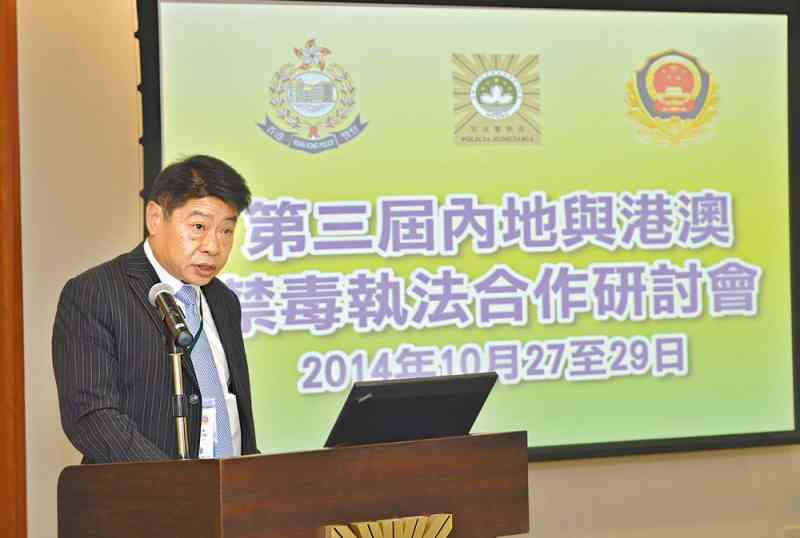 Narcotics Bureau (NB) Chief Superintendent Chan Kin-hung led a nine-member delegation to represent the Force at the 3rd Symposium on Drugs Enforcement in Mainland, Hong Kong and Macao held in Macao on October 28. The symposium brought together senior officers from the drug enforcement authorities in the Mainland, Hong Kong and Macao. Its main objectives were to promote exchange of intelligence and experience on drug enforcement and work together for a tripartite network among the three law enforcement agencies. The Director-General of the Narcotics Control Bureau of the Ministry of Public Security, Mr Liu Yue-jin, headed the Mainland delegation while the Director of Macao Judiciary Police, Mr Wong Sio-chak, led the Macao delegation. More than 40 delegates attended the tripartite symposium, including leading members of the Hong Kong, Macao and Taiwan affairs offices of the Ministry of Public Security as well as the Police Liaison Department of the Liaison Office of the Central People's Government in the Macao SAR. The three parties summarised the progress that had been made in tripartite co-operation since the last symposium. They unanimously agreed that their co-operation had been fruitful and had strengthened the intelligence exchange channel. Discussion during the symposium focused on the drug situation, trafficking trend, control of new drugs, equipment for drug enforcement, and anti-money laundering measures. The delegates highly praised the mechanism for holding regular meetings among tripartite key members in drug enforcement to enhance co-operation among Hong Kong, Macao and Guangdong. With this solid foundation, the three parties indicated that they would continue to expand the realm of co-operation, create new modes of co-operation and enhance ability to combat cross-boundary drug trafficking and money laundering. Finally, the symposium passed Mr Liu's proposal to hold the 4th Symposium in the Mainland next year.